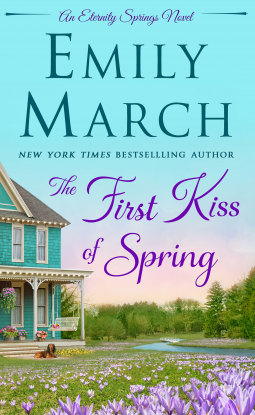 Emily March welcomes spring with a dazzling romance set in Eternity Springs, a town of healing and new beginnings. Caitlin Timberlake is ready for a change of scenery from her big New York job and single life. After meeting and connecting with Josh Tarkington at her friend's wedding in Telluride, she is even more determined to see her dreams realized and snag her dream guy. The First Kiss of Spring is filled with layers of pain, love, and hope. Caitlin's move home comes as a surprise to her parents and she has to convince them that she's serious about starting a business in Eternity Springs and hopefully starting her own family one day. When Josh finds out that Caitlin is starting her business next door, he knows his carefully created life is about to come crashing down. In most romances, the man usually pursues the woman but Caitlin flips the script by pursuing Josh with single-minded focus. It's fun to watch him try to resist her while she's basically got him wrapped around her finger! This story is full of highs and lows that kept me turning the pages. When Josh gets hurt in a selfless act, he starts to relive his past which is presented in journal entries throughout the story and gives insight to his determination to not get involved with Caitlin. From the first chapter, I knew this wasn't going to be the average romance, and Emily March did not disappoint. With every turn in the novel I never knew what direction it was going to take or whether there could really be a happy ending to this story. I'm definitely sticking with this series as it continues and will get caught up on everyone's previous stories. It's a whole romantic world to explore! The Eternity Springs series is perfect for fans of RayAnne Thayne, Robyn Carr, and Jen Gilroy!